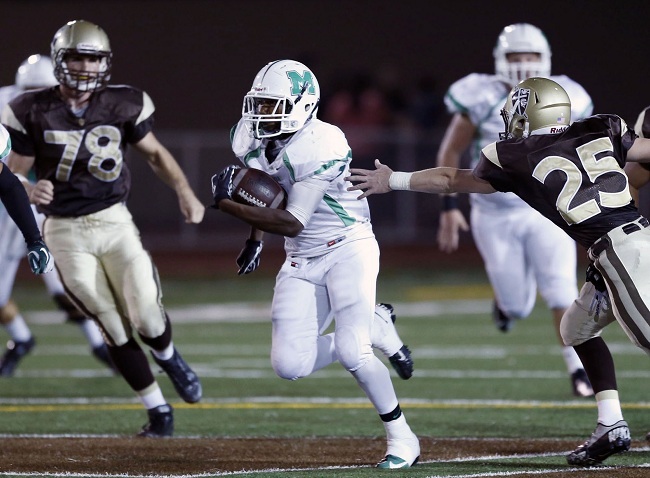 What a night for Monrovia and Rio Hondo Prep, both knocking off the top seeds in their division. Monrovia beat Paraclete for its third straight championship and a possible state bowl berth, and Rio Hondo Prep did the same, winning its second straight title and 15th championship in school history. Damien’s Isaiah McCullough scores two of his 11 points on a put-back. Check out the rest of Keith Birmingham’s photo gallery. There came a point when Keppel boys basketball coach Hung Duong threw up his hands and begged for someone to take a charge. “When you’re getting man-handled on the boards, you’ve got to do something,” Duong said. When Damien wasn’t knocking in three-point shots or scoring in transition, they were cleaning up the boards in a 64-48 victory over Keppel in the quarterfinals of the Baldwin Park/Sierra Vista boys basketball tournament on Thursday. Damien guards Jeremy Hemsley and Jared Dizon each finished with a game-high 16 points. 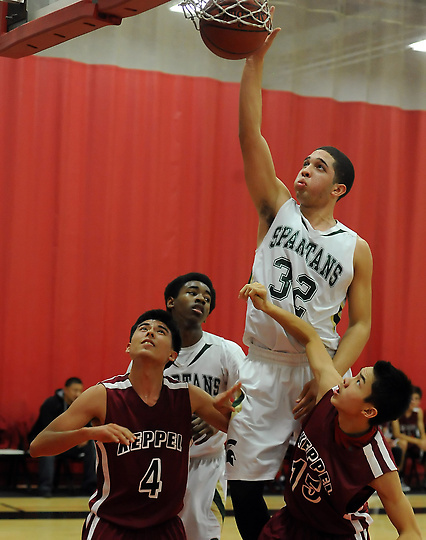 Dizon also had eight rebounds and sophomore Isaiah McCullough finished with 11 points as the Spartans improved to 3-0. Damien will face California, a 63-57 winner over Claremont, in the semifinals tonight at Sierra Vista at 7:30 p.m. In the earlier semifinal, Thousand Oaks, a 76-44 quarterfinal winner over Rowland, will take on Troy at 6 p.m. The winners will meet for the championship on Saturday at Covina High at 7:30 p.m.
Keppel (2-1) fell behind 15 points early in the second quarter, but Brandon Fujii’s steal and basket cut Damien’s lead to 29-20. But the Spartans closed the half on a 10-0 run and started the third quarter with 12 straight points to extend the run to 22 consecutive and a 51-22 lead that put the game out of reach. Damien graduated 6-foot-8 Chris Reyes, but the Spartans made up for their lack of size by attacking the rim. Of Hemsley’s 16 points, nine came on foul shots. Keppel fell behind by 31 points, but it kept battling, getting a team-high 11 points from Kyler Lee. Spencer Briglio finished with nine points and 6-foot-4 sophomore center Bertram Make finished with eight. “I’m proud of our kids for not folding in the second half,” Duong said. “It could have been a 40-point game. Say What? Pacifica University has taken over the old campus at Western Christian High in Covina, near the campus of Royal Oak Middle School. Baseball coach Matt Stark explained that it’s a college designed for sports with an emphasis on sports degrees. Pacifica will play an Independent schedule against NCAA D-2, D-3 and NAIA teams — mostly on the road with home games at nearby locations. We’re working on a story as we learn more about the university, but browse their website, this could be a terrific outlet for area athletes. For a better understanding, check out the presidents message: Welcome to Pacifica University, your gateway to the future, where many opportunities await you! As the only true sports university in the U.S. we focus on programs which prepares our students to enter the $650 billion a year sports industry. Pacifica offers associate, bachelors and masters degrees along with several PhD programs. Pacifica classes are a combination of on campus, on line and hybrid giving students more flexibility in scheduling. The University offers day, evening and weekend classes and programs. Education/Certificate programs are also available to help high school seniors and lifelong learners to enter the various areas of personal enrichment in sports leading to occupations, careers and work advancement. Rowland vs. Thousand Oaks, 6 p.m. Troy vs. Colony, 7:30 p.m.
Damien vs. Keppel, 6 p.m.
Claremont vs. California, 7:30 p.m.
Christian Espinoza scored 21 points and also had six assists and three steals to lead Los Altos (2-0) past San Gabriel (0-2). Sal Lopez added 12 points and David Tolmachoff had eight points and six rebounds. 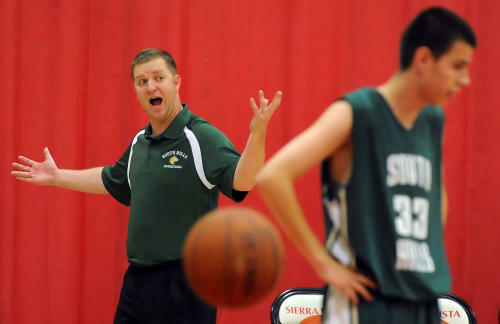 Thanks to a 21-point second quarter the Heralds easily got past Anaheim in nonleague play. Tyler Chacon led Whittier Christian (2-0) with 20 points and nine rebounds while Stephen Nolin totaled 14 points and nine rebounds. Colin Ashworth contributed 10 points and Ryan Esslinger grabbed 8 rebounds and scored three points. Leading the Lancers (2-0) to the win was Mauriana Clayton scoring 17 points and grabbing nine rebounds. Paulina Santana contributed with 10 points, six rebounds, four assists and three steals. With the loss Cantwell Sacred Heart dropped to 1-1. The Chargers (1-0) were led in scoring by Erin Houston, who had 16 points. Alsion Strycula contributed nine points. Northview dropped its season opener. Anthony Villa Gomez scored and Steve Robledo headed home a cross from Grayson Iwasaki to lead the Huskies to a win at Troy. Iwasaki was credited with both assists as the Huskies improved to 2-0-1. The Titans (1-0) started the season with the win over Westridge. Senior Hope Welder scored four goals with Jordyn Duncan adding two. Ge Vontray Ainsworth didn’t transfer from Covina High School to Monrovia to get a shot at a CIF-Southern Section title, but it may work out that way. Ainsworth, who came to the Wildcats after his family moved into the area from Covina, has been a key contributor for the Wildcats, who look to win their third consecutive Mid-Valley Division title when they host Paraclete on Friday at 7 p.m.
“I’m happy that we even made it this far,” said Ainsworth, who was on the losing side last season when Monrovia beat Covina in the semifinals. “I’m going to be happy if we win it. Ainsworth, who rushed for 1,464 yards and nine touchdowns for Covina last season, has 1,155 yards and 14 scores for the Wildcats. He’s also been a dominant force on defense, where he leads the Wildcats with 14 1/2 sacks, including four last week to help Monrovia advance to the finals with a 42-31 victory over Sierra Canyon. The Tribune Football season is over, it’s time to select the all-area team, player of the year and coach of the year …. The Tribune all-area football team includes a player of the year, coach of the year, defensive player of the year and 25 of the most deserving players that fill out an all area team. It usually includes a QB, 2RBs, 3WRs, 5 OL, Placekicker, Punter, All-Purpose, 3DL, 3LB, 3DB, Safety. We will sort it all out this week, but I’m always curious what you think? 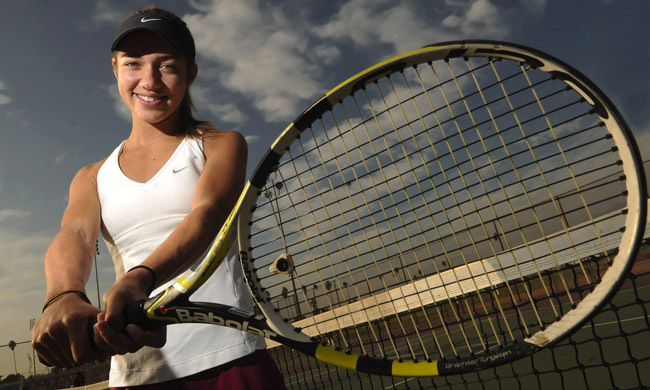 West Covina High School girls tennis standout Alexis Valenzuela is not what you would consider to be classically trained. The just-turned 17-year-old didn’t grow up on country club courts. Nor did she have a family who could afford the very best private coaches. Yet when the top 16 players in the CIF-Southern Section meet today at the Seal Beach Tennis Club to start deciding who’s the No. 1 player in the section, Valenzuela will be among them … for the third consecutive year. Not bad for a kid who learned the game by starting in a Covina Parks and Recreation tennis camp and honed her skills by playing on local high school courts or at the public park. Sure, Valenzuela has had her share of private coaching … in Lakewood. But generally, the top players in the Southern Section don’t come from places like West Covina. Valenzuela started playing at age 7 after she first tried baseball and didn’t like it. By the time she was 10, she was ranked in the Southern California top 10 for her age group. Realizing she was on to something big, Valenzuela’s family got her a private coach and her father Ernie did his own bit of coaching. Once at West Covina, she has been under the tutelage of Bulldogs coach Mike McConville, who is adamant that Valenzuela is the best girls athlete in school history. It’s an upbringing that has certainly been good enough to get Valenzuela to this point of her career, but it’s not quite to the level of what most of the other top 16 girls enjoyed on their way up. “They can afford the top coaches, we can’t really afford the top coaches,” Valenzuela said. West Covina is not known for its tennis. It’s a football school and every other sport comes second. Valenzuela has done her best to change that, however. She’s won the league title and been named league MVP all four years. Valenzuela didn’t lose a league match in her final three seasons. Valenzuela has already secured a scholarship to Cal State Fullerton, where she plans to attend nursing school and become a nurse practitioner. There could be a bid at a professional career mixed in if things break right. For now, though, her focus is on ending her storied high school career with a bang. That means surviving today’s matches and returning on Thursday when the field of 16 is reduced to four and a battle to be the top player in the Southern Section will begin in earnest.